Art Monthly magazine’s talk programme on Resonance FM started in February 2009 and is broadcast on the second Friday of each month at 5pm. In each show Art Monthly critics discuss their writing in the latest issue. The programme is hosted by Matt Hale who has worked at Art Monthly since 1991 and produced by Frederika Whitehead. 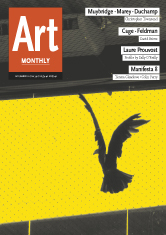 Art Monthly magazine offers an informed and comprehensive guide to the latest developments in contemporary art. This entry was posted in Art Monthly Monthly, Shows and tagged ACAF, Alexandria Contemporary Arts Forum, Alfredo Jaar, Biennales, Biennials, Brumaria, Cartagena, Chamber of Public Secrets, colin perry, Common Culture, CPS, Drexciya, Expanded Violences, Klara Kemp-Welch, Lewis Biggs, Liverpool Biennial, Liverpool Biennial 2010, Mainfesta 8, Marx Lounge, Mediterranean Union, Murcia, Nicolas Sarkozy, Pedro G Romero, Tania Bruguera, teresa gleadowe, The Otolith Group, Thierry Geoffroy, Touched, tranzit.org, Tris Vonna-Mitchell, Wanda Raimundi-Ortiz on November 18, 2010 by artmonthly.